I thought I would show you a picture of my hyacinth now that it is blooming. 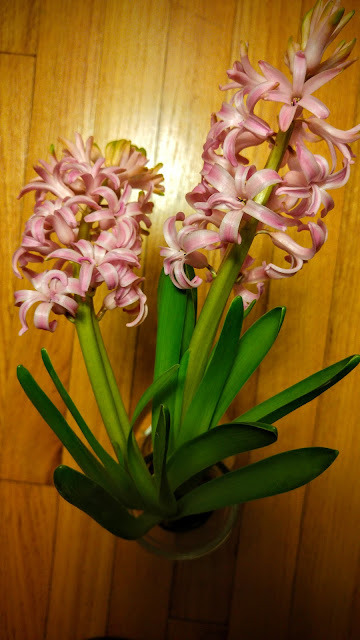 It is so pretty and fills the whole room with its scent. I love having a bit of spring in the house. We will just ignore the fact that we are supposed to get snow this weekend. The kids are annoyed that snow might come this weekend because they want a snow day from school, so Monday would be better, and I am annoyed that it might snow at all because I want spring. If it does snow (which I doubt, I think it will all just blow past us and all the hype will be for nothing) there is nothing better than curling up with a good book. I have a few Persephone books that I have been saving for the right moment. Maybe a snowy weekend will be just that moment. Meanwhile, here is what I have been reading lately. 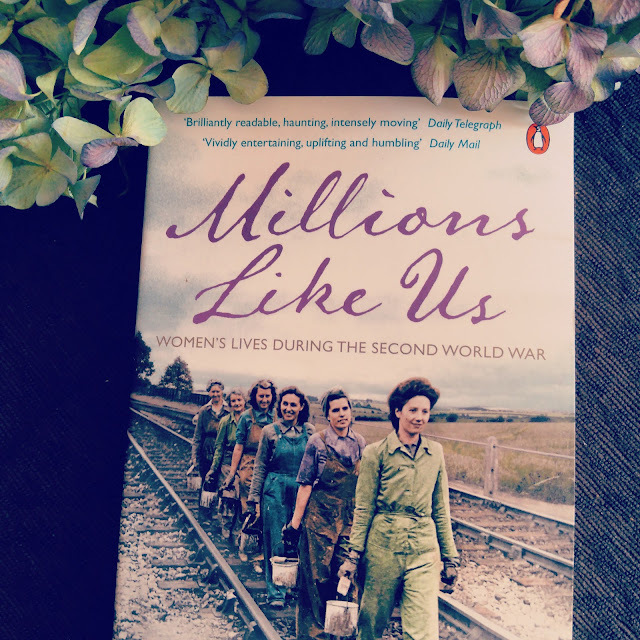 My obsession with the British home front continues with Millions Like Us by Virginia Nicholson. It is a comprehensive look at women's lives during and just after the war. Through interviews and diaries she examines the way lives and attitudes changed over the course of ten years. I have read a lot about the logistics of life during that time, about ration cards and the blackout and the blitz. This is more an examination of how the women themselves changed. Before the war women were usually at home and it was taken for granted that the home was a woman's place. Then the war came, the men went off to fight and the women filled the empty spaces in factories, on farms, in offices, and in many, many other positions. Many of these positions were ones of great responsibility. For example, women who worked at Bletchley Park and helped in breaking the secret German codes were instrumental in helping to win the war. Then the war ended, the men came home, and it was impossible for things to go back to the way they were. Some men and women wanted life to return to what it had been. Some men and women embraced the changes. Either way, it was a time of great upheaval. If you have any interesting in this time period, I highly recommend this book. It is absorbing and detailed. One of the women extensively quoted in Millions Like Us is Helen Forrester. She went on to become an author and also wrote a four volume autobiography of her life in Liverpool. I was able to find ebooks of a few of her works on Open Library. Right now I am reading Lime Street At Two which covers the war years. I also read Liverpool Miss which deals with her early teenage years. She had a difficult and unpleasant life in many ways but it is interesting to read the books in conjunction with Millions Like Us. Lastly, I just started The Claverings by Anthony Trollope. I really haven't read enough to say much about it yet. Other than that in the first chapter we have a woman marrying a rich older man (he is 36, hah!) for his money and position, and we also have the young schoolmaster who is in love with her and who she has pledged her love to previously. So we start off with a love triangle and I am sure the drama will only multiply. I do like Trollope. I heard from news outlets and weather forecasts that the snowstorm is really bad. Flights cancelled, state of emergency, and all that. I do hope you stay safe. And of course, enjoy your books! Sounds like you have a lot of comfort reads to savor. We aren't getting the storm as bad as some but it is snowing like crazy and the wind is really blowing. They are saying to stay off the roads. I am going to stay home, bake muffins, and read books. I really love learning about WWII, so I'm going to see if my library has Millions Like Us. We aren't supposed to get as much snow as you, probably only about 10 inches in total. The roads aren't good though. A lot of the plows have been sent down closer to the shore where the storm is worse. My daughter is excited for warmer weather tomorrow too, and a snowman is definitely part of her plans. The rest of us are still burnt out from all the snow last year.